It's Christmas in July! The sun is shining and sleigh bells are ringing, as festive new designs are ready to give you a head start on fabulous decor and gifts. 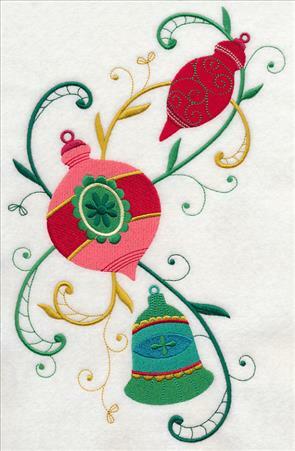 Santa, Mrs. Claus, and the reindeer trim the North Pole tree in sweetly whimsical designs, and colorful ornaments dance in delightful arrangements. 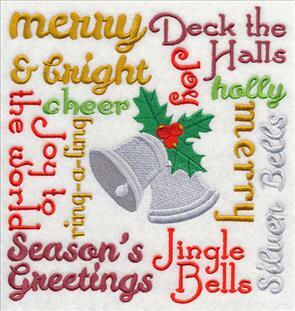 Warm holiday greetings fill Christmas word squares, one-color designs are instant classics, and Art Nouveau reindeer and poinsettias bring holiday cheer. Fill your stocking to the brim with these festive new designs! And enjoy Christmas in July! 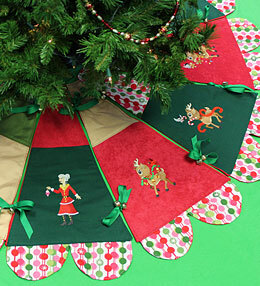 Jingle all the way to festive decor with this jingle bell tree skirt! Click here for free project instructions! Trimming the tree is a much loved tradition at the North Pole. 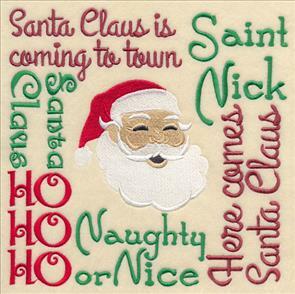 Santa Claus, Mrs. Claus, Rudolph, and all the reindeer enjoy the festivities. 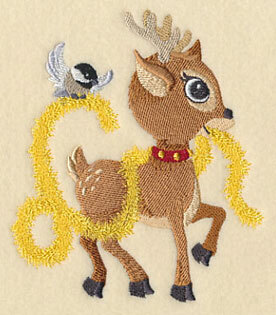 Rudolph and his feather friend are ready to ring in Christmas. 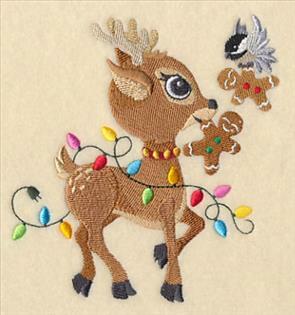 A chickadee and his reindeer pal prance and dance with holiday decorations. Very cute on stockings! 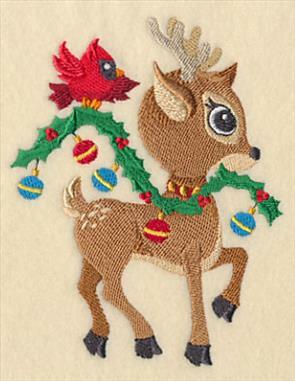 3.73" x 5.18" and 3.08" x 4.28" and 2.47" x 3.42"
Create a special bib for baby's first Christmas with an adorable reindeer and his bird buddy. 4.31" x 5.02" and 3.57" x 4.16" and 2.87" x 3.33"
A chickadee helps put the candy canes on the tree while a cardinal carries one end of the ribbon. 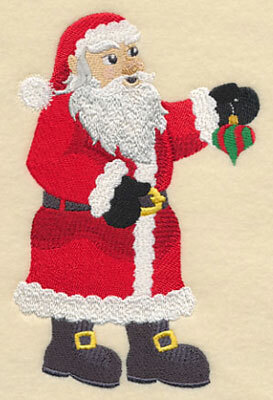 Add to wall hangings and mini-quilts to tell a charming Christmas story. 3.98" x 5.12" and 3.29" x 4.24" and 2.63" x 3.39"
Ornaments, garland, and lights are made even sweeter with gingerbread cookies. 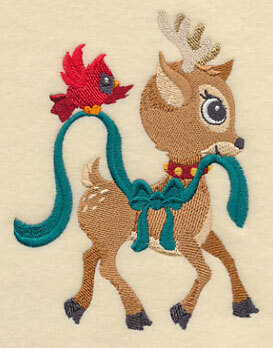 Put your favorite reindeer on a sweatshirt for a festive look kids of all ages will love. 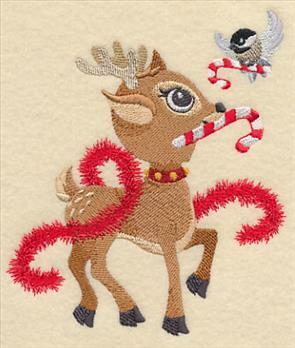 4.64" x 5.06" and 3.83" x 4.19" and 3.30" x 3.51"
Stockings, pillow covers, and wall hangings are natural places for these charming holiday designs. 5.86" x 7.26" and 4.85" x 6.02" and 3.13" x 3.88"
Santa and Mrs. Claus make sure everything is placed just right. 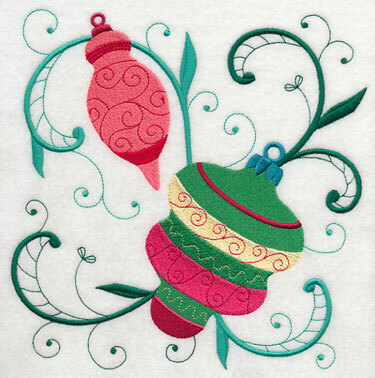 Stitch holiday whimsy onto quilts, wall hangings, and tree skirts with these designs! 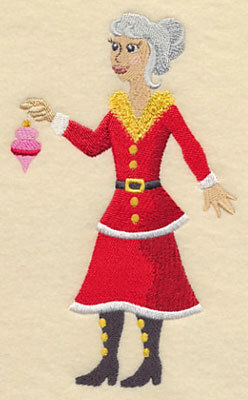 3.72" x 6.05" and 3.07" x 5.00" and 2.37" x 3.85"
Santa, Mrs. Claus, and pals trim the tree in sweet and playful designs. 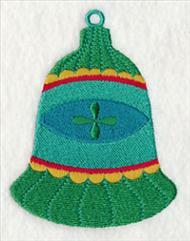 Stitch onto stockings, quilts, towels, sweatshirts, tote bags, and more for fun holiday embellishments. 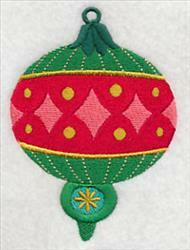 Dazzling Christmas ornaments dance in delightful designs for decor. A variety of shapes and sizes from a luxurious feature to single ornaments mean endless project possibilities. 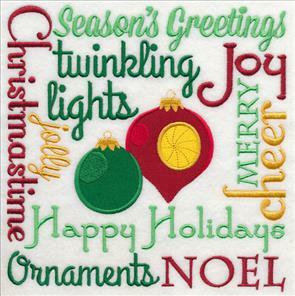 Bright colors and festive patterns fill ornaments with holiday cheer in designs sure to create splendid centerpieces on pillow shams, wall hangings, mantel runners, and table linens. 6.90" x 10.48" and 6.19" x 9.39" and 5.14" x 7.80" and 4.52" x 6.87"
Delicately flowing filigree forms a graceful backdrop for an ornament pair. 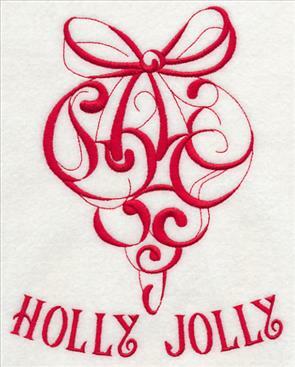 The square shape is softened by the gentle curves of the design elements, and makes the perfect embellishment for stockings, pillow shams, towels, and seasonal totes. 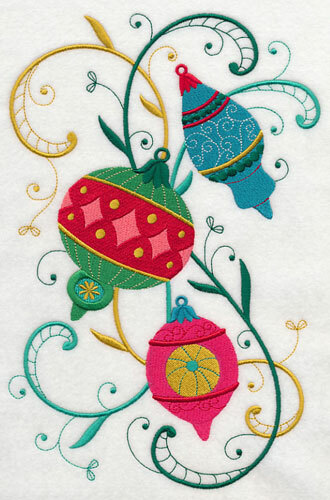 7.78" x 7.78" and 6.88" x 6.87" and 5.88" x 5.87" and 4.88" x 4.87" and 3.88" x 3.87"
A graceful ornament spray is bright and colorful on stockings, towels, placemats, and more. 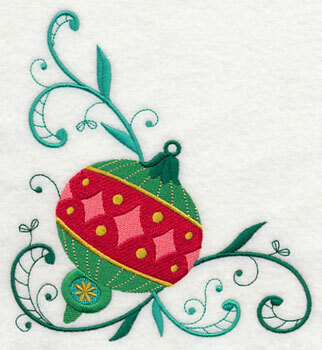 6.88" x 11.15" and 5.79" x 9.39" and 4.81" x 7.80" and 4.23" x 6.86"
Add an ornament border to placemats, then stitch the coordinating single ornament designs (further down the page) onto cloth napkins for festive holiday place settings. 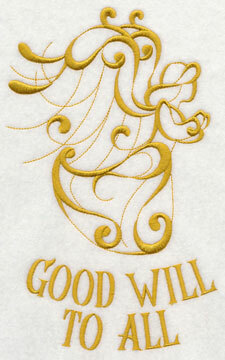 This design has been formatted for the Endless Hoop; may also be used in standard hoops. 11.72" x 4.81" and 9.37" x 3.85" and 7.81" x 3.21" and 5.99" x 2.91"
Corners dress up towels, placemats, and pillow shams with colorful style. 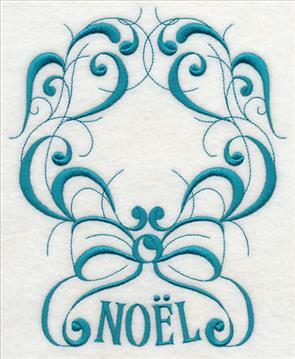 They're also perfect for tucking onto stockings and decorating holiday quilt corners. 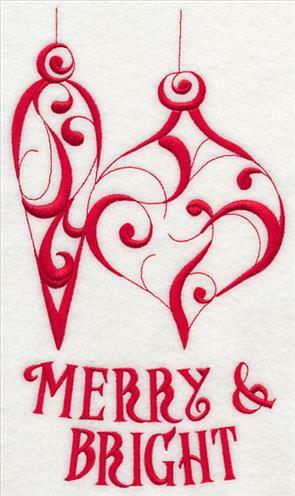 5.84" x 6.27" and 4.89" x 5.25" and 3.60" x 3.86"
Brighten smaller places like cloth napkins with single ornaments, and create combinations of your favorites on larger items like stockings and wall hangings. Let your imagination fly with all the glorious possibilities! 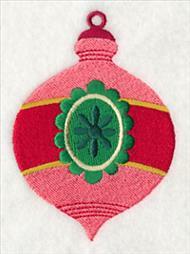 1.56" x 3.61" and 1.08" x 2.50"
Add a sweet home-stitched touch with colorfully embroidered ornaments on gift bags. 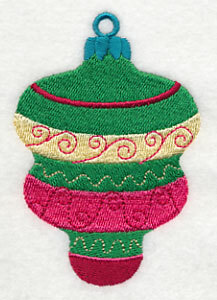 2.26" x 3.53" and 1.61" x 2.51"
Create a unique design composition by combining one of the larger ornament designs (like the square) with one or two of the single ornaments. Pretty on pillow covers and tote bags! 2.60" x 3.83" and 1.70" x 2.51"
Christmas is only five months away! Get a jump start on seasonal decor before the holiday rush begins with the Trim the Tree Potpourri Design Pack. 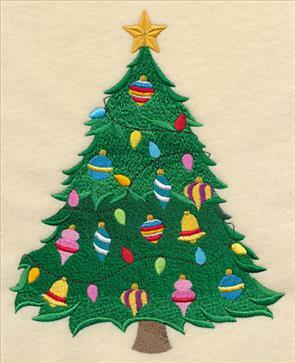 Stitch fa-la-la fabulous table linens, pillow shams, stockings, tree skirts, towels, and more with these colorful designs. The designs are sold singly (use the links above), or get several in a pack! Four sizes are available to suit your projects. Click on a link to a pack to see the designs included and to add the pack to your cart. 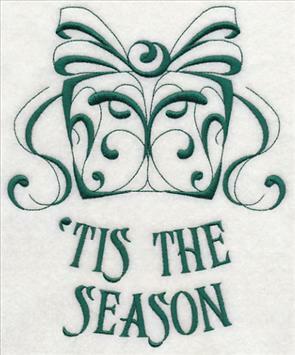 **XL - 25 designs smaller than 7" x 11.8"
**Lg - 25 designs smaller than 6" x 10"
**Md - 24 designs smaller than 7.9" x 7.9"
**Sm - 22 designs smaller than 5" x 7"
Filled to the brim with holiday cheer and season's greetings, Classic Christmas Squares are merry and bright on pillow covers, wall hangings, towels, seasonal totes, and much more. 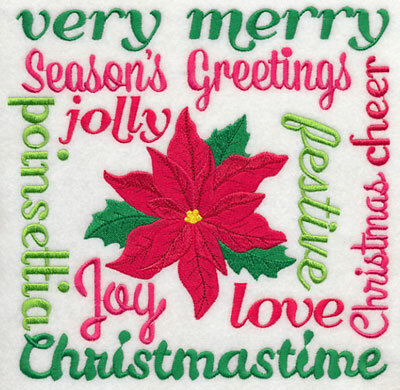 Stitch Christmastime joy and love with a poinsettia surrounded by joyful holiday expressions. 7.80" x 7.59" and 7.09" x 6.90" and 6.02" x 5.86" and 5.00" x 4.86" and 3.86" x 3.75"
Let your imagination take flight like one of Santa's reindeer with all the possibilities for these designs! Whether you've been naughty or nice, Santa and Rudolph will make you smile. 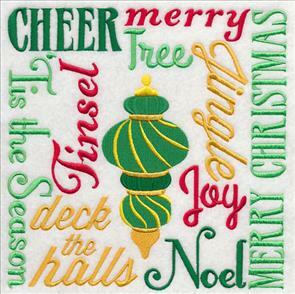 7.81" x 7.45" and 7.24" x 6.91" and 6.14" x 5.86" and 5.12" x 4.89" and 3.86" x 3.68"
Classic Christmas elements appear in the middle of each square, surrounded by words that bring to mind all the beloved traditions of the holidays. 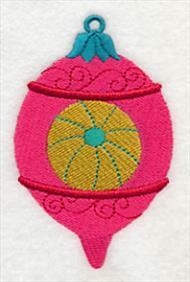 Perfect for stockings and mini-quilts! 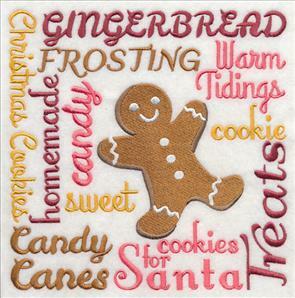 7.80" x 7.72" and 6.97" x 6.90" and 5.91" x 5.85" and 4.90" x 4.85" and 3.86" x 3.82"
Cookies for Santa, candy canes, gingerbread frosting...embroider delicious Christmas embellishments with these bright squares. 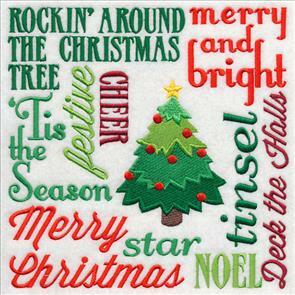 Spice up holiday aprons, towels, trivets, and more! 7.70" x 7.80" and 6.90" x 6.99" and 5.86" x 5.93" and 4.86" x 4.92" and 3.81" x 3.86"
With Christmas just a little over five months away, you can hear those silver bells! Get ready to deck the halls with fa-la-la-fabulous decor before the holiday rush hits. 7.79" x 7.80" and 6.90" x 6.91" and 5.86" x 5.87" and 4.88" x 4.89" and 3.86" x 3.86"
Christmas will be here before you know it! 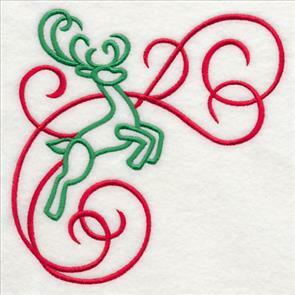 Stitch Classic Christmas Squares onto pillow covers, stockings, tote bags, wall hangings, towels, and more for festive decor and gifts everyone will love. Order the designs individually by clicking the links above, or get the pack with all 9 designs. Five sizes are available to suit any project. 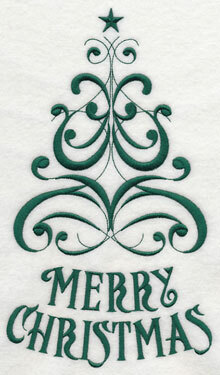 Smooth-stitching, classic one-color designs celebrate the season with fashionable filigree and warm holiday greetings. 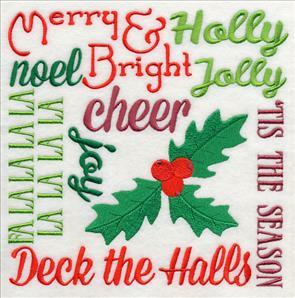 Inspired by the ever-popular Celebrate the Season designs, quick-to-stitch and stylish silhouettes are a fast way to dress up kitchen towels, dining room decor, holiday apparel, and much more with graceful Christmas cheer. 5.84" x 8.27" and 4.62" x 6.51" and 2.74" x 3.86"
Create a set of flour sack towels with smooth satin stitch designs for a splash of color in the kitchen. They make excellent hostess gifts, Secret Santa presents, and stocking stuffers. 5.43" x 9.40" and 3.97" x 6.86" and 2.24" x 3.86"
Choose your favorite colors to match project needs with these designs for excellent versatility. 7.44" x 5.85" and 6.14" x 4.83" and 3.86" x 3.04"
Create a set of placemats in a jiffy with these bright designs! And whip up a batch of coordinating napkins lickety-stitch. Setting a festive table has never been easier. 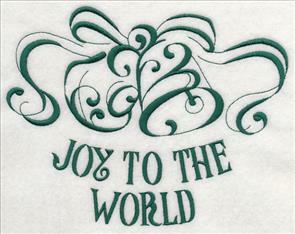 5.87" x 7.15" and 4.56" x 5.55" and 3.17" x 3.86"
One color designs are fast and fa-la-la fabulous on smooth fabrics like flour sack towels, tea towels, quilter's cotton, and Jersey knit. Easy and elegant for quick holiday projects! 5.84" x 7.10" and 4.85" x 5.89" and 3.17" x 3.85"
Make beautiful seasonal decorations and simply elegant gifts with classic holiday designs. 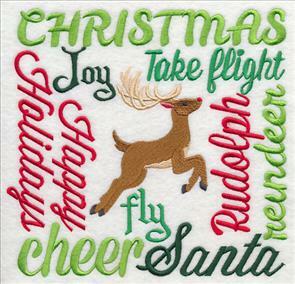 5.87" x 7.03" and 4.74" x 5.68" and 3.22" x 3.85"
Celebrate the Season II designs are fast-stitching additions to stockings, pillow covers, wall hangings, table linens, shirts, and more. 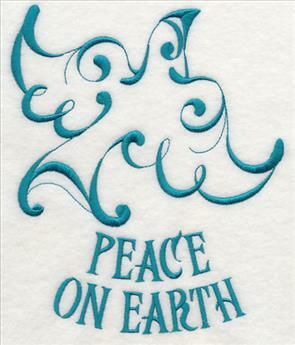 One-color designs with warm greetings and classic images are quick and easy holiday embellishments. 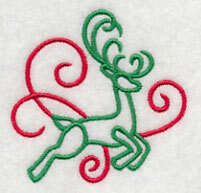 Bring a simply elegant Christmas look to projects with Art Nouveau reindeer. 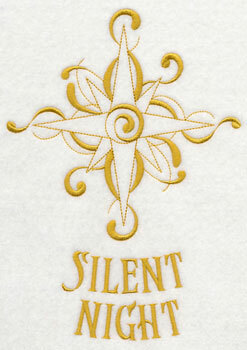 Smooth satin stitches bring holiday cheer to flat-nap towels, shirts, stockings, table linens, and more. Open spaces let the fabric show, and only two thread colors mean you can easily change them if you like for an artful composition. 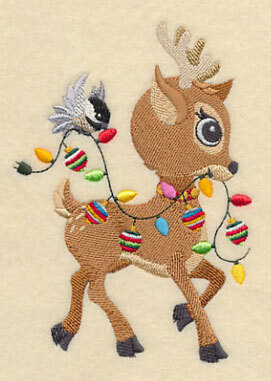 5.86" x 7.40" and 4.89" x 6.17" and 3.06" x 3.86"
Reindeer prance in a border alive with natural energy and grace. 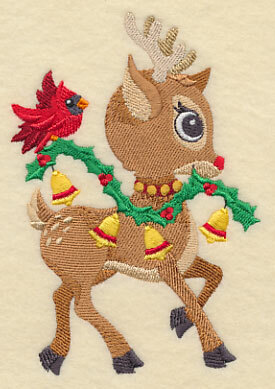 Let these handsome reindeer run along tablecloth borders, placemats, and napkins for delightful dining decor. This design has been formatted for the Endless Hoop; may also be used in standard hoops. 9.40" x 2.98" and 6.00" x 2.09" and 3.88" x 1.44"
A corner and an accent design are perfect for sprucing up tea towels, linen napkins, and shirt pockets for the season. They're also ideal for decorating stockings. 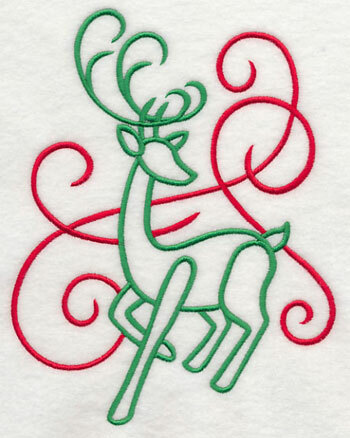 Reindeer in the traditional Art Nouveau style add a classic touch to Christmas decorations. 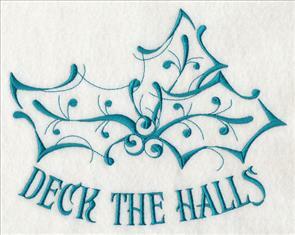 Stitch onto stockings, shirts, table linens, flat-nap towels, and more for a light and lovely look. 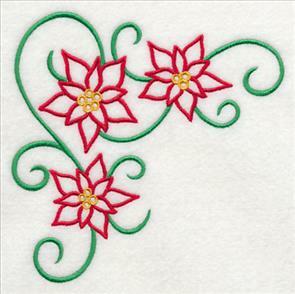 **Md - 6 designs smaller than 5" x 7"
**Sm - 4 designs smaller than 4" x 4"
Let Art Nouveau Pretty Poinsettias bloom on your holiday projects! Flowing filigree and open spaces give these designs a graceful look that is breezy yet elegant on table linens, wall hangings, pillow covers, and mini-quilts. 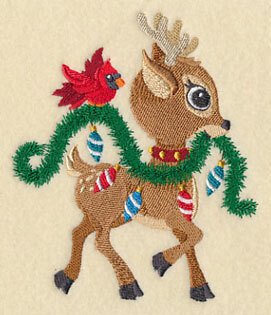 5.85" x 6.89" and 4.86" x 5.73" and 3.28" x 3.86"
Christmas comes but once a year -- deck the halls to celebrate with a fast and festive poinsettia border on stockings, shirts, tree skirts, and more. This design has been formatted for the Endless Hoop; may also be used in standard hoops. 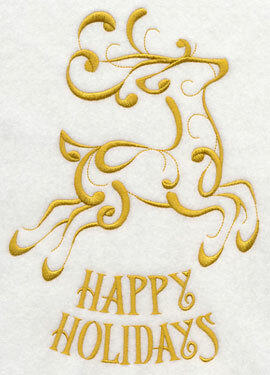 9.40" x 2.88" and 5.98" x 2.04" and 3.86" x 1.30"
Only three color changes make these designs as fast as Santa's reindeer! 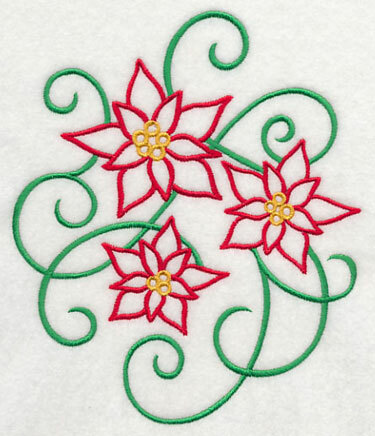 Poinsettias bloom with beauty anywhere you stitch them. 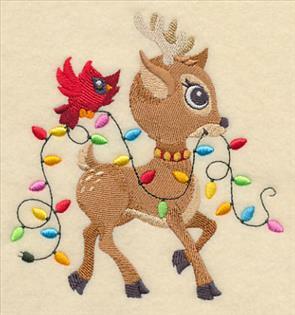 Bring them to life on your holiday projects! 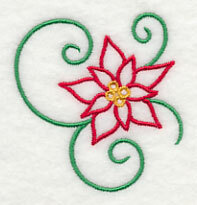 Light and breezy Art Nouveau poinsettia designs bring smooth elegance to Christmas decor and apparel. 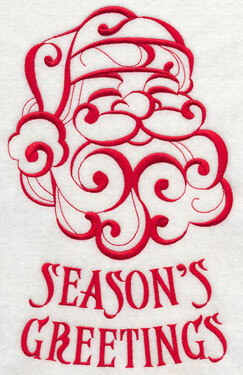 Dress up stockings, table linens, pillow shams, wall hangings, and more with these classic designs! Each week this space is reserved for the Special Request of the Week, where one customer's design request is featured. 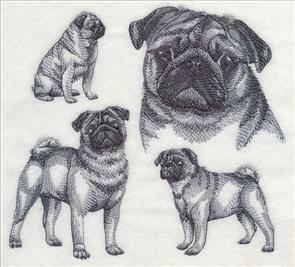 Kathleen requested Pug dogs, which the American Kennel Club describes as "multum in parvo" which means "a lot of dog in a small space." 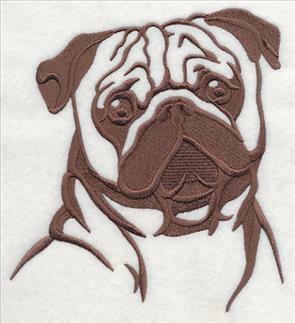 Playful and loving, the Pug is one of the oldest breed of dogs and has been a favorite since before 400 BC. 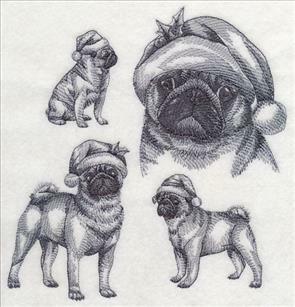 Pugs are still beloved by many, and are perfect subjects for tote bags, pillow covers, towels, and more -- with Santa hats and without! Thanks for the great idea, Kathleen. 7.36" x 7.81" and 6.90" x 7.32" and 5.85" x 6.21" and 4.85" x 5.15"
Sweet eyes peek out from beneath wrinkled brows in fun and fast silhouette designs. 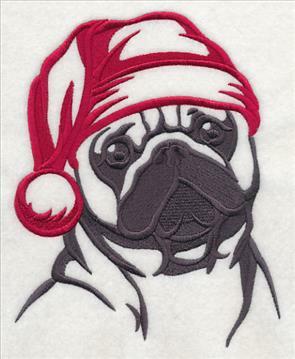 Add a lovable Pug to T-shirts, tote bags, wall hangings, Christmas stockings, pillows, and more! 5.86" x 7.30" and 4.88" x 6.08" and 3.11" x 3.87"